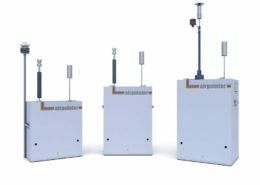 The airpointer® is the world’s first integrated, certified and type approved according to European Norms and the regulations of the US Environmental Protection Agency, compact air quality monitoring system. A turn-key product that can be quickly and easily installed with 50% lower total cost of ownership than conventional metering stations. A modular system equipped with gas analysers from Thermo Fisher and/or Teledyne API, also allowing customised add-ons (e.g. vehicle counters, noise sensors, wind sensors). There are over 500 airpointer® units installed globally. Due to its small size and weight, the airpointer® can be installed in a wide variety of indoor and outdoor applications including among others public places, industrial sites, traffic sites, and meteorology, as well as in diverse environmental conditions.